Register Log In GliderCENTRAL Forums Regulations & Laws illegal or restrictions? I have read that gliders are illegal in PA but I have also read that they are not and that they only have restrictions such as needing a permit. Does anyone know about this? Unless it has recently changed (which I understand change has already happened or is in the works), gliders in PA need a permit but they aren't issuing any permits so...it makes them illegal. These Pennsylvania statutes represent the state's exotic pet laws. �Exotic wildlife.� The phrase includes, but is not limited to, all bears, coyotes, lions, tigers, leopards, jaguars, cheetahs, cougars, wolves and any crossbreed of these animals which have similar characteristics in appearance or features. The definition is applicable whether or not the birds or animals were bred or reared in captivity or imported from another state or nation. Because of the "but not limited to" part is open for interpretation, it remains unclear if gliders are included or not. Yes, I was thinking about moving to PA because I work there so I called the Wildlife Department and they said they don't issue permits to own them; if they did at one point they do not anymore. 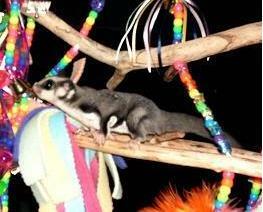 It is impossible to own gliders legally in PA. My search continues for an apartment in NJ. Yes, sadly, I would not adopt to a place where it is illegal to own them. If they get caught I believe it is only a fine (I don't think they euthanize Sugar Gliders like they do with larger pets such as skunks or monkeys), but they may check to see if they've be rehomed which means the babies would just have to move again. Yea, I wont even risk it. There is a lot of talk of legalizing them in PA, but nothing has happened yet. Hopefully it does, but until then, I wouldn't move there or sell gliders to someone who lives there. I just had someone from PA wanting to adopt from me. I gave them the info to find out for sure since it was a bit unclear with the new regulations. I suggested that she call them to find out. I was surprised when she called me back to let me know what she found out. The new reg has passed the PA State House of Representatives, but has to go through the State Senate (I could have the House/Senate backwards here) and then be signed by the Govenor. They have no estimated time frame for this or even know whether or not it will ever pass the next step. At this time, they are illegal to own in PA and are subject to confiscation and euthanized if discovered. Please don't adopt to anyone in PA ~ it's not worth it.